The Lichfield is a charming octagonal style summerhouse featuring Georgian style windows and fully glazed double doors. 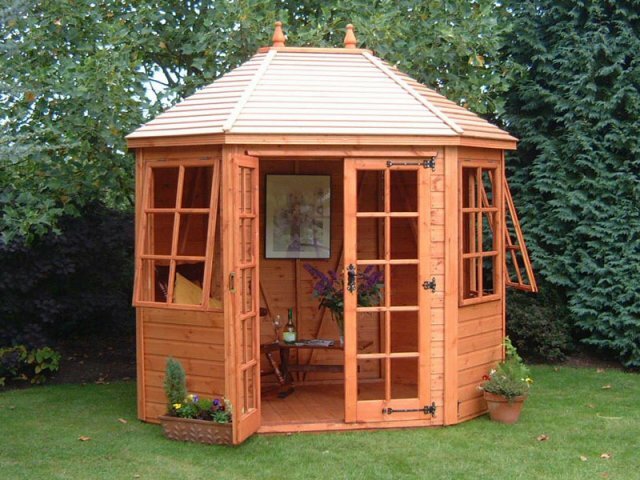 This building is made with 12mm redwood cladding throughout and is also available with an attractive cedar clad roof to provide a distinctive traditional look to the summerhouse. This beautiful building is available with a wide range of upgrade options, including tanalisation, toughened glass, heavy duty flooring and a factory painting service. The Lichfield Summerhouse measuring 8x6 (2.43m x 1.82m). The Lichfield Summerhouse measuring 8x8 (2.43m x 2.43m).